Both THE LEGO MOVIE and THE LEGO BATMAN MOVIE were far more entertaining than I expected. The plots may have been standard issue kid flick stuff about being true to yourself and/or the importance of friends and family, but the jokes were clever and plentiful. Heck, THE LEGO MOVIE even managed some emotional resonance. So despite not having much of an idea what Ninjago was (other than having put together a few Lego sets bearing the trademark), I was hopeful that THE LEGO NINAJAGO MOVIE would be up to those standards. It’s not, but it’s not terrible, either. 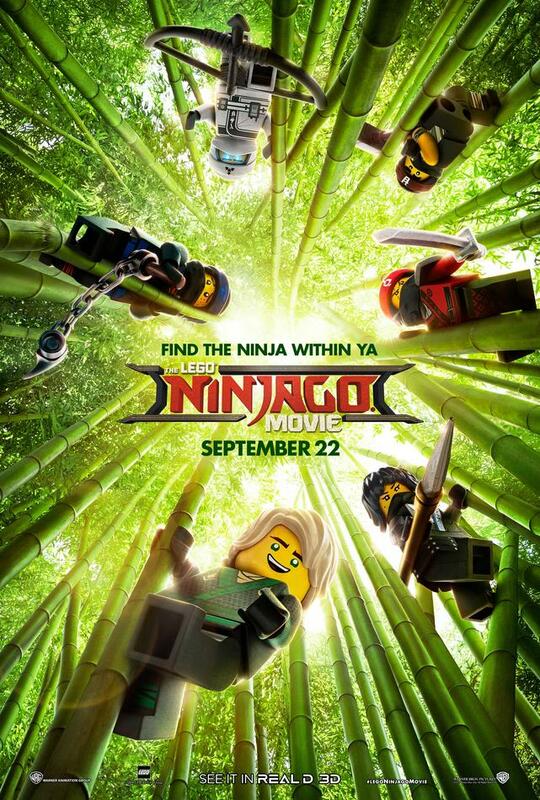 The plot is that Lloyd (voice of Dave Franco) and his pals are secretly a band of elemental warriors with really cool vehicles who defend their city against volcano dwelling bad guy Garmadon (Justin Theroux). There’s an added complication, though. Garmadon is actually Lloyd’s father. Garmadon knows Lloyd is his son, although he isn’t much of a dad, but he doesn’t know that his progeny is the same guy leading the resistance fighters who always manage to repel his attacks. And none of Lloyd’s friends besides his fellow ninjas know he’s a hero either. They are, however, well aware of who his dad is, and never miss a chance to pick on him about it. There’s also a wise sensei (Jackie Chan) who gives Lloyd and his pals the requisite pep talks, and a destructive ultimate weapon in the form of a cat named Meowthra that must be defeated by going on a quest for the ultimate ultimate weapon. Believe in yourself and the power of friendship, blah blah blah. Nothing wrong with all that, mind you. It’s certainly sufficient for the under 12 set who are going to be the primary audience for this. Unfortunately the jokes aren’t up to the caliber of the previous Lego movies, leaving grownups with less to hold their interest. There are still a few good yucks, and the stuff with Meowthra is fun, but overall THE LEGO NINJAGO MOVIE is just okay. 2 ½ out of 4 stars.